Unlock Shoulder Growth This Month! Superhero shoulders can be yours, but you've got to work the angles. Use this powerful pair of shoulder-building workouts to unleash your growth potential in just four weeks! How many clichés highlight shoulders? "The weight of the world is on his shoulders." "I'm shouldering the load." "That guy has a chip on his shoulder." You get it. The shoulders are popular in our vernacular simply because of their endless strength and aesthetic potential. Think about it: Of all the possible muscles to describe carrying the weight of the planet, we chose shoulders. It's time to pump those often-overlooked arm cappers up to their full potential! If you want to build shoulders that will impress people, this is the guide for you. Do these two workouts every week for a month. Try to give yourself 3-4 days of rest in between workouts so you can be ready to hit it hard each time. 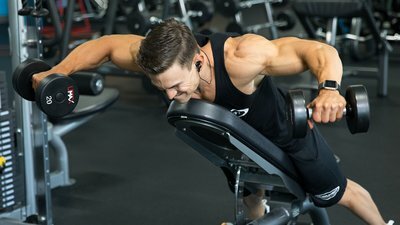 Neither shoulder workout looks like a lot, but since you're doing two a week, keeping them short and sweet is best for recovery and growth. The impressive range of motion shoulders have is what makes them such a versatile muscle group—it also makes them very prone to injury. Before every workout, warm up for 5-10 minutes with range of motion movements and light sets, so your elbows and rotator cuffs are primed and ready to work. Do this before you start either workout, using lighter weights and resting 20-30 seconds between sets. Rest for 2 min. between sets. The purpose of this first workout is to go as heavy as possible. The focus is on straight power. Don't go so heavy that you sacrifice form and put yourself at risk for injury just for the sake of lifting a few extra pounds—a bruised ego heals a lot faster than a torn rotator cuff. But, if you find you're able to do more reps than the workout calls for, challenge yourself by increasing the weight. You can always use wrist wraps and elbow sleeves to protect these weaker areas, as long as you know you're lifting a weight you can handle. Rest two minutes between sets so you can fully recover and give your all to the next set. Your first shoulder-building workout was all about power and strength. This one is the polar opposite. The priority here is to feel the muscles working, and the amount of resistance is secondary. You might be able to do the seated Arnold presses for 10 reps using the 60s, but you'll feel the muscles working more using the 40s. For each exercise in this workout, go with a weight that's a little bit lighter than you'd normally lift. This allows you to focus on feeling the muscles work and emphasizes the time those shoulders spend under tension. Shifting your focus to less weight and higher burn will pay off in the end. With that same mindset, remember, you're not trying to set a speed record here. Time under tension (TUT) is the name of the game, so take 3 seconds to perform the negatives for each movement. When you perform the next rep, pause for a second to feel that muscle contract. TUT is what makes the difference between good shoulders and great shoulders. Your rest periods for this workout are 45-60 seconds, max. Get right back to work as soon as you can for each set to keep that pump going and get the best growth possible.